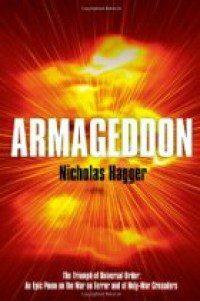 Armageddon is Nicholas Hagger’s second poetic epic. It is the successor to his Overlord, which was the first major poetic epic in the English language since Milton’s Paradise Lost. Overlord was about the Second World War from D-Day to the dropping of the atomic bomb and also followed an American hero, Eisenhower. Like Overlord, Armageddon is also in the tradition of Homer’s Iliad and Virgil’s Aeneid, and its epic sweep includes higher and lower worlds in the Universalist manner. Both qualify as American epics, though written by an English poet. The only other poet to have written two major poetic epics is Homer. Armageddon is a contemporary epic poem about the major event of our own time. Written in blank verse, it narrates the defining event for civilisation today: the American President Bush’s struggle against the Islamic extremism of Osama bin Laden and al-Qaeda, in the course of which Bush transforms himself, the US and the world. It follows the War on Terror from September 11, 2001 through the wars in Afghanistan and Iraq, which some believe were illegally waged for reasons of oil. Covertly supported by Iran, bin Laden is shown as possessing at least 20 nuclear suitcase bombs (a purchase confirmed by Hans Blix of the IAEA in 2004), some of which he plans to explode simultaneously in 10 American cities – hence the title. The poem presents all sides of the War on Terror and makes sense of the first decade of the 21st century. Nicholas Hagger’s books reveal truths that have been hidden. His poems convey his quest for Reality and the vision of unity, and reflect the follies and vices of the Age. In his second poetic epic he brings a new approach to the War on Terror.